Performers include: Marlon Wayans, Shawn Wayans, John Witherspoon, and Anna Maria Horsford. Brothers Shawn and Marlan Williams (show creators and real-life brothers Shawn and Marlan Wayans) live together in New York City. The two siblings are like night and day: Shawn wants to marry his girlfriend Lisa Saunders (Lela Rochon) and settle down while Marlon just wants to have a good time. Shawn is responsible, has a steady job and plans to own his own business. Brother Marlan shows up for his job at the diner of their father, John “Pops” Williams’ (John Witherspoon), when/if he feels like it or after a wake-up call and prodding from his brother. Hard-working Pops and the goal-orientated Shawn share a special bond while Marlon has to work harder for attention. His plan to succeed doesn’t include labor and he’d rather find a get-rich-quick scheme. Although Shawn often asserts his role as the stable older brother, he oftentimes can’t help but get involved in his baby brother’s crazy ideas. While the Williams brothers may not always get along, they also can’t get along without each other. 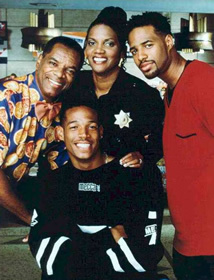 Frequently weighing in on the brothers’ lives are security guard Dee (Anna Marie Hotsford), Grandma Ellington (Ja’Net DuBois), and friends T.C. (Phill Lewis), Dupree (Jermaine “Huggy” Hopkin), and White Mike (Mitch Mullany). More about: The Wayans Bros.